MedReady 1700 Free Shipping | MedReady Inc.
SKU: 1700. Categories: Medication Dispensers, Non-Monitored Medication Dispensers. Tags: Dispensers, Pill Dispenser. 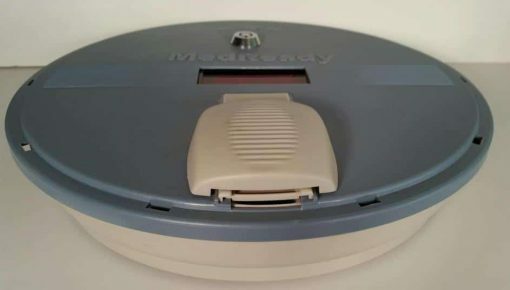 This 1700 MedReady comes standard with the Lower Frequency alarm which from our experience is much easier to hear. 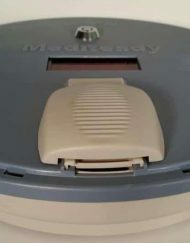 MedReady 1700 Package comes complete with A/C Adapter, Rechargeable Battery, Medication Tray, Blue Locking Lid, 2 keys, and loading rings for 3x and 4x per day dosing. This dispenser holds up to 28 doses of medication and can dispense from 1 to 4 times per day. Each dispensing compartment can hold up to 9 M&M size pills. This is a non-monitored dispenser. What a fantastic and high quality product. It has save the day for my family! It works, unlike a product that I purchased earlier from XXXXX (redacted to not smear our competition). It is so easy to use and manage. I love the flexibility of a second tray with a lid. That saves me tons of time managing the meds. as I can fill the tray at home and then head over to my brother’s house and swap out the trays in less than a minute. THANK YOU!!! GREAT PRODUCT. I purchased this after having numerous problems with a smaller device from another company. This device is large, but it is actually a benefit – my patient does not try to tamper with his “flying saucer” as he did with the other machine. 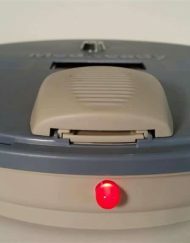 He also used to remove the batteries or pry up the cover, and neither of those happen with the MedReady! I like having the flexibility of up to 4 alarms. I also have heard such positive comments from VNA, and other agencies that visit him regularly. This device can help him be independent and SAFE, and those are two very important things to us.